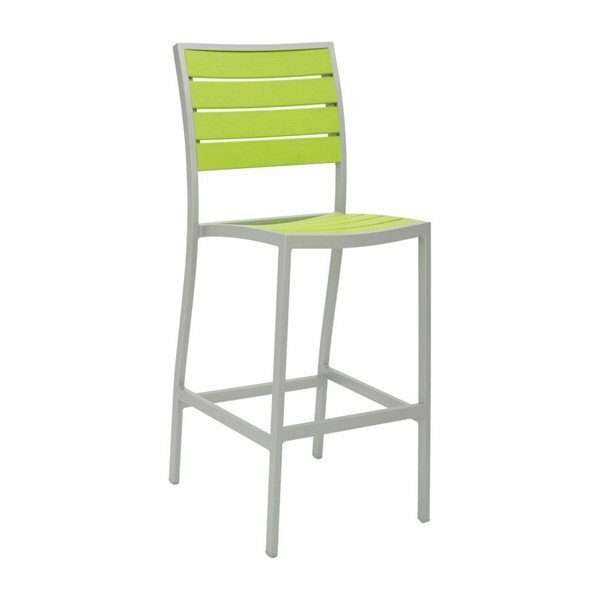 Tropical Breezeway Outdoor Restaurant Bar Height Chair with Aluminum Frame and Faux Teak Seat - 14 lbs. Our Tropical Breezeway Resturant Bar Height Chair features vivid colors that will brighten up any outdoor patio. The seat and back are faux teak that is both lightweight and comfortable. Made of commercial grade aluminum the frame is protected with a thorough powder coated finish that is perfect for resisting the outdoor elements. Includes a 13" high footrest for extra support and comfort. This bar chair is an ideal seating solution for beachside bars, hotels, and resorts. Our restaurant furniture comes with a 2-year commercial warranty. • Dimension: W 16.5" x D 16.5" x H 33"